I suppose this is becoming a bit of a series. When I read the first volume of Michael Palin's diaries, I ended up thinking for a while why I liked the man's work so much, and what it meant. When I read John Cleese's autobiography, I did the same. And now comes Gilliamesque, an impressionistic, coffee-table type collection of ruminations, photos, artwork and other errata that more or less gives Terry Gilliam, the most visually adventurous and unpredictable of the Pythons, a chance to tell the story of his life. And it's a story which I happened to find sometimes unsettling, because I could see so much of myself in it, leading me to wonder if I wouldn't have more in common with Gilliam than all of the other members of Monty Python. Maybe that's silly. (And heaven forbid that any discussion of the Pythons be silly.) Still, Palin's and Cleese's stories made me think about their contribution to Monty Python's comedy, and what that contribution meant for how we understand British comedy, or England in the 1970s, or the postwar world of popular entertainment, or all three. But Gilliam's story instead kept making me think about my own early life. He grew up in a rural environment, surrounded by animals, exploring and fishing and hunting (and eating the food he and his family and neighbors caught or killed or raised and slaughtered). He grew up in a church-going family, with the church as the center of his social life, and read the Bible well enough that he still remembers all the stories. He got into trouble with his parents for partaking of elements of pop culture which they disapproved of. He was an ambitious Boy Scout, but had conflicts with his Scout leaders. He went to a religious university, where his closest friends were snarky but definitely non-radical malcontents. Again and again, while I didn't have many experiences at all similar to his (we were in Washington State, not Minnesota and California; we were pretty stable financially, not poor like his family; we were committed Mormons, not the denominationally easy-going Protestants the Gilliams were; etc. ), I kept stumbling across retrospective reflections from Gilliam that read exactly like statements which I could imagine, with only a little fine tuning, coming out of my mouth. What he says about animal husbandry ("I've always wondered how city kids learn these things....I think anyone who eats meat (as I do) should spend a few hours in a [slaughterhouse] at some point in their lives, just to understand the process you're a part of"--pp. 6-7), or scripture ("I do think the generations who've grown up without learning the Bible...have really missed out. Stories like David and Bathsheba are the building blocks of our culture, but who knows Bathsheba now? Who even knows David?"--p. 11), or college ("What I ended up leaving with was something much more valuable: the ability to question some--if not all--of the assumptions I'd grown up with, and to carry on questioning them if I didn't like the look of the answers I was getting"--p. 40) strike me as personal truth. Discovering that one of the Pythons actually appears to have constructed his self-understanding along lines and through experiences that actually resonate so much with me personally was a strange surprise. Unfortunately, there's little in Gilliamesque which implies much connection between Terry Gilliam's life and worldview and his Python work (which wasn't at all the case with either Palin or Cleese; the men who came through in those diaries and in that autobiography clearly are very much present in the Python writers and performers they otherwise were). Is that because Gilliam, looking back at work that he did more than 45 years ago, doesn't think it was all that significant? It's hard to avoid that conclusion, which I think is a missed opportunity. When he talks about his method as "taking images out of their original contexts" and "I'd find [images of] people in serious situations--soldiers in wartime, politicians on the campaign trail--and liberate them by putting them in a dress or making them do something ridiculous" (p. 126), he's expressing his blunt, farcical, burlesque attitude toward the world around him. Basically, Gilliam comes across as a man who is thoroughly aware that there really are--or at least that many people really believe there are, or at the very least really think there ought to be--great and good things out there in the world and universe (his references to fine architecture throughout the book are near-reverential), and he has no interest in undermining those great and good things...he just wants to poke them in the eye and slip a whoopee cushion under their butts. Understanding this about the man opens up something about his relationship to the rest of the Pythons which he never explores, I think: if everyone else was, on one level or another, either railing against or making their reluctant peace with or passive-aggressively undercutting the internally-collapsing-but-still-operative social world of Ye Olde England, Gilliam, the foreigner, just unapologetically loved it, because it gave him so much that he could happily blow raspberries at. And he really does love England, or at least the England he fell in love with. From his very first visit to the UK, Gilliam describes himself as experiencing an "enhanced sense of security and well-being" (p. 89), and he finds himself feeling a genuine sadness that the bustling yet cloistered and somewhat rundown life that he got to know when he first arrived--"from the late sixties even into the seventies, London still functioned like an ancient city...things where still being made there, there was a proper mixed economy" (p. 120)--was remade by Thatcher and global capitalism into (in his view) an ersatz copy of the always-closing-the-deal New York City he briefly thought he liked, but actually hated and feared. One might suspect that the steady work he found with Python, and the career doors it opened for him, were more valued by Gilliam because of the crash-course in High Absurd Englishness it offered him, and not for anything actually doing the animation for, or eventually performing in, episodes of Flying Circus actually taught him. So what is important to him? And what really does connect, artistically and otherwise, with the story of his life? His movies, of course. But unfortunately, from The Adventures of Baron Munchausen on Gilliam sees to have operated outside his own muse, occasionally poking at it with a stick, curiously, at least as much as he's actually inhabited it. (Gilliam essentially admits as much at one point, at the end of his account of making 12 Monkeys: "When I look back at the Brazil me, he was still going strong--unstoppably even, at least in his own mind--whereas that's not so much the case from the nineties onward. Where did that guy go? You could say it was Munchausen's syndrome that did it for him...except that it wasn't the syndrome, it was real"--p. 241). Gilliam's ability to harness his own bric-a-brac-filled sense of ridiculousness to something that generates a real, meaningful cinematic story hasn't disappeared entirely: much of it was on display in 12 Monkeys, The Fisher King, and Fear and Loathing in Las Vegas, and there was even a surprise return to some of it in The Zero Theorem--which Gilliam curiously refers to as a "period film" (p. 281), which makes me want to see that not-great-but-better-than-I-thought-it-would-be movie again. Still, everyone--including Gilliam himself--recognizes that 1985's Brazil was the only time he truly pulled all his talents together into a single, powerful package. His long reconstruction of the angers (Margaret Thatcher's seemingly sadomasochistic control over Parliament), regrets (why hadn't he done the missionary thing and gone to Africa to serve humankind? ), fears (Ronald Reagan is actually President of the United States?! ), pre-occupations (all the beautiful architectural remnants of Britain's industrial and imperial past, being abandoned or turned into luxury flats), loves (his father, while working construction, got a long nail stuck in his eye and he just drove himself home? ), and curiosities (so how do pneumatic tubes work anyway? ), which led him to construct such a visually splendid, intellectually challenging, satirically hilarious, and ultimately disturbing cinematic story was, for me, the absolute highlight of the book (pp. 199-205). His snarky comments about Robert De Niro are pretty great too. 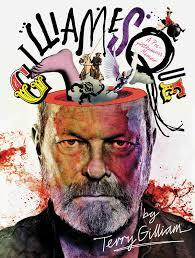 So Gilliam--not the film director he might have been, but a talented and fascinating man. Probably not my favorite member of Monty Python, the comedy troupe, but quite possibly the one I'd most like to meet. Now, Eric Idle and Terry Jones, hurry up and write your books, so I can complete this series, okay? Have you read Graham Chapman's version? If not, you should. I haven't, and I really ought to. Maybe this summer. _Brazil_ is a 1980s period piece, yet it holds up eerily well today. Not just the terrorism stuff, but the critique of late capitalism and the depiction of a society that seems to have lost its middle class. (As far as we can tell, there's hardly anyone between Sam Lowry's grubby, just-barely-making-it clerical existence and the ultra-rich world of his mother and her friends.) And of course, the moment the boss's back is turned, everyone in the office is switching on YouTube -- sorry, Casablanca. And Sam Lowry's dreams could be straight out of a MMORPG. I'd be curious to know about the snarky comments re: De Niro. Doug, that's a really great comment. The elements of the story dealing with terrorism, state security, the obsession with appearance and secrecy, etc., are all pretty obviously, but I'd never thought about it from a socio-economic perspective before. Given the existence of the plumbers--who appear to be state employees, but at least act somewhat separate from the data-entry slaves we see every where else--it may be that there is some tiny middle-class in Brazil's world, but not much. As for the rogue plumber, De Niro, Gilliam relates that he'd really wanted and came prepared to read for the part of Jack Lint, whom Gilliam definitely didn't want to give to anyone who actually had an intimidating screen presence. When he told De Niro the role he wanted for him, De Niro took it, but continued to hang around the set, watching other performers shoot their scenes, and giving lots of unwanted advice. Saturday Night Live Music: "Rainbow's Cadillac"
Saturday Night Live Music: "Never Surrender"
So, What Has Russell Been Watching?